This application is a division of prior application Ser. No. 09/389,252, filed Sep. 3, 1999, now U.S. Pat. No. 6,245,833 B1, which was a continuation-in-part of prior application Ser. No. 09/209,117, filed Dec. 10, 1998, now abandoned, which was a continuation-in-part of then prior application Ser. No. 09/072,506, filed May 4, 1998, now abandoned. Z is preferably a halogen atom or —OR3. In embodiments in which —OR3 is an alkoxy group, R3 preferably is an alkyl group of 1 to 8, more preferably 1 to 4, and most preferably 1 to 2 carbon atoms. In embodiments in which —OR3 is an acyloxy group, R3 preferably has the formula —C(O)R4, wherein R4 generally may be any nonionic, monovalent moiety other than hydrogen. Representative examples of moieties suitable as R4 include any alkyl, aryl, or alkaryl moieties, and combinations thereof. 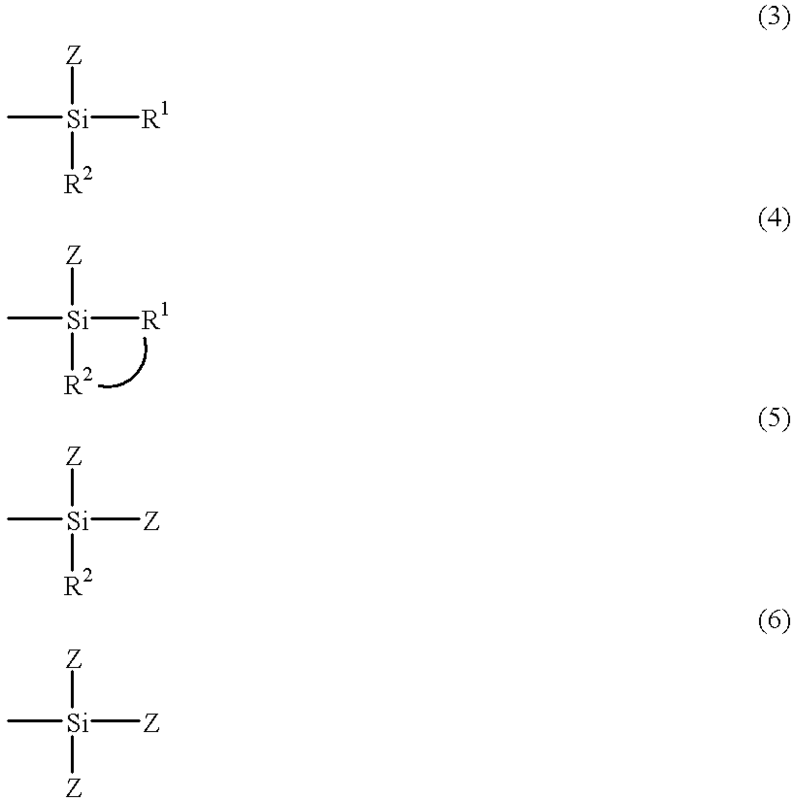 Any of such R4 moieties, if cyclic, may include a plurality of rings if desired. In preferred embodiments, R4 is CH3—. Crosslinkable silane components suitable for use in the ceramer composition of the present invention are commercially available from numerous sources. Generally, suitable crosslinkable silane components contain at least one hydrolyzable silane moiety and at least one polymerizable moiety other than a silane moiety. The polymerizable moiety preferably contains either (meth)acrylate, allyl, styryl, amino, or epoxy functionalities, while the hydrolyzable silane group is usually an alkoxy silyl moiety (generally methoxy or ethoxy) which serves as a binding site to hydroxy-functional inorganic substrates via displacement of the alkoxy groups. Additional information concerning crosslinkable silane components may be found in the book by E. P. Pleuddeman (“Silane coupling Agents”, Plenum Press, N.Y., 1982, pp. 20-23 and 97) as well as in technical reports by S. Sterman and J. G. Marsden entitled “Theory of Mechanisms of Silane Coupling Agents in Glass Reinforced and Filled Thermoplastic and Thermosetting Resin Systems”, Union Carbide Corporation, New York, and “A Guide to Dow Corning Silane Coupling Agents”, Dow Corning Corporation, 1985, pp. 2-13, the disclosures of which are incorporated by reference herein. The colloidal inorganic oxide is desirably provided in the form of a sol (e.g., a colloidal dispersion of inorganic oxide particles in liquid media), especially sols of amorphous silica. Unlike other forms in which the colloidal inorganic oxide particles may be supplied (e.g., fumed silica which contains irregular aggregates of colloidal particles), colloids of such sols tend to be substantially monodisperse in size and shape and thus enable the preparation of ceramer compositions exhibiting good optical clarity, smoothness, and surprisingly good adhesion to substrates. Preferred sols generally contain from about 2 to about 50 weight percent, preferably from about 25 to about 45 weight percent, of colloidal inorganic oxide. Sols useful in the practice of the present invention may be prepared by methods well known in the art. For example, silica hydrosols containing from about 2 to about 50 percent by weight of silica in water are generally useful and can be prepared, e.g., by partially neutralizing an aqueous solution of an alkali metal silicate with base to a pH of about 8 or about 9 (such that the resulting sodium content of the solution is less than about 1 percent by weight based on sodium oxide). Sols useful in the practice of the present invention may also be prepared in a variety of forms, including hydrosols (where water serves as the liquid medium), organosols (where organic liquids are used as the liquid medium), and mixed sols (where the liquid medium contains both water and an organic liquid). See, e.g., the descriptions of the techniques and forms given in U.S. Pat. Nos. 2,801,185 (Iler) and 4,522,958 (Das et al. ), whose descriptions are incorporated herein by reference, as well as those given by R. K. Iler in The Chemistry of Silica, John Wiley & Sons, New York (1979). Hydrosols are commercially available in both acidic and basic forms and with a variety of particle sizes and concentrations under such trademarks as “LUDOX” (E. I. DuPont de Nemours and Co., Inc. Wilmington, Del. ), “NYACOL” (Nyacol Co., Ashland, Mass. ), and “NALCO” (Nalco Chemical Co., Oak Brook, III.). Additional examples of suitable colloidal silicas are described in U.S. Pat. No. 5,126,394, incorporated herein by reference. Although either acidic or basic sols are suitable for use in the ceramer compositions of the present invention, it is desirable to match the pH of the sol with that of the curable binder precursor in order to minimize the tendency of the colloids of the sol to flocculate when the sol and the curable binder precursor are combined. For example, if the sol is acidic, the curable binder precursor also preferably is acidic. On the other hand, if the sol is basic, the curable binder precursor also preferably is basic. The sols may include counterions in order to counter the surface charge of the colloids. Depending upon pH and the kind of colloids being used, the surface charges on the colloids can be negative or positive. Thus, either cations or anions are used as counter ions. Examples of cations suitable for use as counter ions for negatively charged colloids include Na+, K+, Li+, a quaternary ammonium cation such as NR′4+, (wherein each R′ may be any monovalent moiety, but is preferably H or lower alkyl such as CH3), combinations of these, and the like. Examples of counter anions suitable for use as counter ions for positively charged colloids include HSO3 − and R-COO− where R represents an alkyl carboxylate. One representative class of monofunctional free-radically-curable monomers suitable in the practice of the present invention includes compounds in which a carbon-carbon double bond is directly or indirectly linked to an aromatic ring. Examples of such compounds include styrene, alkylated styrene, alkoxy styrene, free-radically-curable naphthalene, alkylated vinyl naphthalene, alkoxy vinyl naphthalene, combinations of these, and the like. Another representative class of monofunctional, free-radically-curable monomers includes compounds in which a carbon-carbon double bond is attached to an cycloaliphatic, heterocyclic, or aliphatic moiety such as 5-vinyl-2-norbomene, 4-vinyl pyridine, 2-vinyl pyridine, 1-vinyl-2-pyrrolidinone, 1-vinyl caprolactam, 1-vinylimidazole, N-vinyl formamide, and the like. wherein R8 is a monovalent moiety, such as hydrogen, halogen, methyl, or the like. Representative examples of such monomers include, linear, branched, or cycloaliphatic esters of (meth)acrylic acid containing from 1 to 20, preferably 1 to 8, carbon atoms, such as methyl (meth)acrylate, n-butyl (meth)acrylate, t-butyl (meth)acrylate, ethyl (meth)acrylate, isopropyl (meth)acrylate, and 2-ethylhexyl (meth)acrylate; vinyl esters of alkanoic acids wherein the alkyl moiety of the alkanoic acids contain 2 to 20, preferably 2 to 4, carbon atoms and may be linear, branched, or cyclic; isobomyl (meth)acrylate; vinyl acetate; allyl (meth)acrylate, and the like. Such (meth)acrylate functional monomers may also include other kinds of reactive functionality such as hydroxyl functionality, nitrile functionality, epoxy functionality, carboxylic functionality, thiol functionality, amine functionality, sulfonyl functionality, combinations of these, and the like. Representative examples of such free-radically-curable compounds include glycidyl (meth)acrylate, (meth)acrylonitrile, β-cyanoethyl-(meth)acrylate, 2-cyanoethoxyethyl (meth)acrylate, p-cyanostyrene, p-(cyanomethyl)styrene, an ester of an α,β-unsaturated carboxylic acid with a diol, e.g., 2-hydroxyethyl (meth)acrylate, or 2-hydroxypropyl (meth)acrylate; 1,3-dihydroxypropyl-2-(meth)acrylate; 2,3-dihydroxypropyl-1-(meth)acrylate; an adduct of an α,β-unsaturated carboxylic acid with caprolactone; an alkanol vinyl ether such as 2-hydroxyethyl vinyl ether; 4-vinylbenzyl alcohol; allyl alcohol; p-methylol styrene, (meth)acryloyloxyethyl trimethyl ammonium chloride, (meth)acrylamidopropyl trimethylammonium chloride, vinylbenzyl trimethylammonium chloride, 2-hydroxy-3-allyloxypropyl trimethylammonium chloride, (meth)acryloxypropyl dimethylbenzylammonium chloride, dimethylaminoethyl (meth)acrylate, vinylbenzyl trimethylammonium chloride, N-(3-sulfopropyl)-N-(meth)acryloxyethyl-N,N-dimethylammonium betaine, 2-[(meth)acryloxy]ethyl trimethylammonium methosulfate, N-(3-sulfopropyl)-N-(meth)acrylamidopropyl-N, N-dimethylammonium betaine, N,N-dimethylamino (meth)acrylate, (meth)acryloyloxyethyl acid phosphate, (meth)acrylamidopropyl sodium sulfonate, sodium styrene sulfonate, styrene sulfonic acid, (meth)acrylic acid, maleic acid, fumaric acid, maleic anhydride, vinyl sulfonic acid, 2-(meth)acrylamide-2-methyl-1-propanesulfonic acid, maleic anhydride, mixtures thereof, and the like. 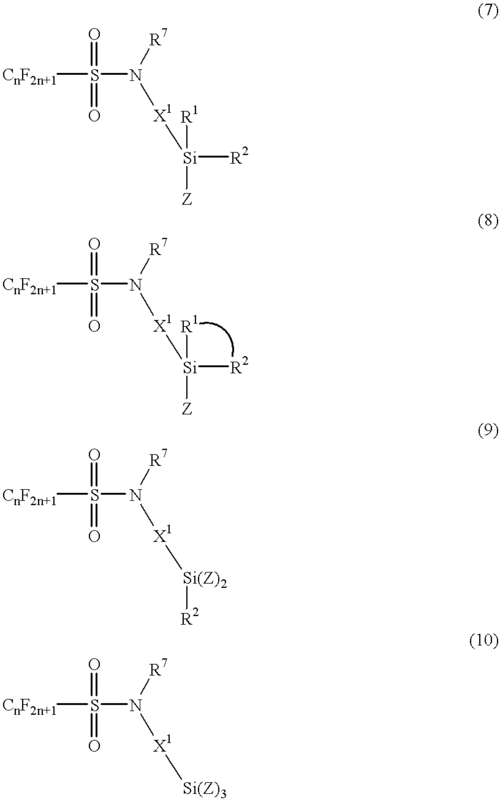 wherein R9 and R10 are each independently hydrogen, a (C1-C8)alkyl group (linear, branched, or cyclic) optionally having hydroxy, halide, carbonyl, and amido functionalities, a (C1-C8)alkylene group optionally having carbonyl and amido functionalities, a (C1-C4)alkoxymethyl group, a (C4-C18)aryl or heteroaryl group, a (C1-C3)alk(C4-C18)aryl group, or a (C4-C18)heteroaryl group; with the proviso that only one of R9 and R10 is hydrogen; and R11 is hydrogen, a halogen, or a methyl group. Preferably, R9 is a (C1-C4)alkyl group; R10 is a (C1-C4)alkyl group; and R11 is hydrogen, or a methyl group. R9 and R10 can be the same or different. More preferably, each of R9 and R10 is CH3, and R11 is hydrogen. Examples of such suitable (meth)acrylamides are N-(3-bromopropion-amidomethyl) acrylamide, N-tert-butylacrylamide, N,N-dimethylacrylamide, N,N-diethylacrylamide, N-(5,5-dimethylhexyl)acrylamide, N-(1,1-dimethyl-3-oxobutyl)acrylamide, N-(hydroxymethyl)acrylamide, N-(isobutoxymethyl)acrylamide, N-isopropylacrylamide, N-methylacrylamide, N-ethylacrylamide, N-methyl-N-ethylacrylamide, N-(fluoren-2-yl)acrylamide, N-(2-fluorenyl)-2-methylacrylamide, 2,3-bis(2-furyl)acrylamide, N,N′-methylene-bis acrylamide. A particularly preferred (meth)acrylamide is N,N-dimethyl (meth)acrylamide. Specific examples of suitable multifunctional ethylenically unsaturated esters of (meth)acrylic acid are the polyacrylic acid or polymethacrylic acid esters of polyhydric alcohols including, for example, the diacrylic acid and dimethylacrylic acid ester of aliphatic diols such as ethyleneglycol, triethyleneglycol, 2,2-dimethyl-1,3-propanediol, 1,3-cyclopentanediol, 1-ethoxy-2,3-propanediol, 2-methyl-2,4-pentanediol, 1,4-cyclohexanediol, 1,6-hexamethylenediol, 1,2-cyclohexanediol, 1,6-cyclohexanedimethanol; the triacrylic acid and trimethacrylic acid esters of aliphatic triols such as glycerin, 1,2,3-propanetrimethanol, 1,2,4-butanetriol, 1,2,5-pentanetriol, 1,3,6-hexanetriol, and 1,5,10-decanetriol; the triacrylic acid and trimethacrylic acid esters of tris(hydroxyethyl) isocyanurate; the tetraacrylic and tetramethacrylic acid esters of aliphatic tetraols, such as 1,2,3,4-butanetetraol, 1,1,2,2,-tetramethylolethane, 1,1,3,3-tetramethylolpropane, and pentaerythritol triacrylate; the pentaacrylic acid and pentamethacrylic acid esters of aliphatic pentols such as adonitol; the hexaacrylic acid and hexamethacrylic acid esters of hexanols such as sorbitol and dipentaerythritol; the diacrylic acid and dimethacrylic acid esters of aromatic diols such as resorcinol, pyrocatechol, bisphenol A, and bis(2-hydroxyethyl) phthalate; the trimethacrylic acid ester of aromatic triols such as pyrogallol, phloroglucinol, and 2-phenyl-2,2-dimethylolethanol; and the hexaacrylic acid and hexamethacrylic acid esters of dihydroxy ethyl hydantoin; and mixtures thereof. The ceramer compositions of the present invention also may include a leveling agent to improve the flow or wetting of the ceramer composition onto the substrate. If the ceramer composition does not properly wet the substrate, this can lead to visual imperfections (e.g., pin holes or ridges) in the ceramer coating. Examples of leveling agents include, but are not limited to, alkylene oxide terminated polysiloxanes such as that available under the trade designation “DOW 57” (a mixture of dimethyl-, methyl-, and (polyethylene oxide acetate-capped) siloxane) from Dow Corning, Midland, Michigan, and fluorochemical surfactants such as those available under the trade designations “FC430” and “FC431” from Minnesota Mining and Manufacturing Company Co., St. Paul, Minn. The ceramer composition can include an amount of a leveling agent effective to impart the desired result. Preferably, the leveling agent is present in an amount up to about 3% by weight, and more preferably about 0.5 to about 1%, based on the total weight of the ceramer composition solids. It should be understood that combinations of different leveling agents can be used if desired. Examples of suitable free radical initiators that generate a free radical source when exposed to thermal energy include, but are not limited to, peroxides such as benzoyl peroxide, azo compounds, benzophenones, and quinones. Examples of photoinitiators that generate a free radical source when exposed to visible light radiation include, but are not limited to, camphorquinones/alkyl amino benzoate mixtures. Examples of photoinitiators that generate a free radical source when exposed to ultraviolet light include, but are not limited to, organic peroxides, azo compounds, quinones, benzophenones, nitroso compounds, acryl halides, hydrozones, mercapto compounds, pyrylium compounds, triacrylimidazoles, bisimidazoles, chloroalkytriazines, benzoin, benzoin methyl ether, benzoin ethyl ether, benzoin isopropyl ether, benzoin isobutyl ethers and methylbenzoin, diketones such as benzil and diacetyl, phenones such as acetophenone, 2,2,2-tri-bromo-1-phenylethanone, 2,2-diethoxyacetophenone, 2,2-dimethoxy-2-phenylacetophenone, 2,2,2,-tribromo-1(2-nitrophenyl)ethanone, benzophenone, 4,4-bis(dimethyamino)benzophenone, and acyl phosphates. Examples of commercially available ultraviolet photoinitiators include those available under the trade designations “IRGACURE™ 184” (1-hydroxycyclohexyl phenyl ketone), “IRGACURE™ 361” and “DAROCUR™ 1173” (2-hydroxy-2-methyl-1-phenyl-propan-1-one) from Ciba-Geigy. Typically, if used, an amount of an initiator is included in the ceramer composition to effect the desired level and rate of cure. Preferably, the initiator is used in an amount of about 0.1 to about 10%, and more preferably about 2 to about 4% by weight, based on the total weight of the ceramer composition without solvent. It should be understood that combinations of different initiators can be used if desired. An ultraviolet stabilizer or ultraviolet absorber improves weatherability and reduces the “yellowing” of the abrasion resistant, ceramer coating with time. An example of an ultraviolet stabilizer includes that available under the trade designation “TINUVIN™ 292” (bis(1,2,2,6,6-pentamethyl-4-piperidinyl)sebacate) and an example of an ultraviolet absorber includes that available under the trade designation “TINUVIN™ 1130” (hydroxyphenyl benzotriazole), both of which are available from Ciba-Geigy. The ceramer composition can include an amount of either an ultraviolet stabilizer or an ultraviolet absorber to impart the desired result. Preferably, the ultraviolet stabilizer or absorber is present in an amount up to about 10% by weight, and more preferably about 1 to about 5%, based on the total weight of the ceramer composition without solvent. It should be understood that combinations of different ultraviolet stabilizers and absorbers can be used if desired. The resultant ceramer composition is then coated onto any substrate for which it is desired to improve one or more of abrasion resistance, impact resistance or stain resistance. Examples of such substrates include any and all thermosetting or thermoplastic items such as camera lenses, eyeglass lenses, binocular lenses, automobile windows and body panels as an automotive topcoat, building windows, bakeware, train windows, boat windows, aircraft windows, vehicle headlamps and taillights, display cases, eyeglasses, watercraft hulls, overhead projectors, stereo cabinet doors, stereo covers, furniture, bus station plastic, television screens, computer screens, watch covers, instrument gauge covers, optical and magneto optical recording disks, graphic displays, and the like. Adhesion of the ceramer coating to the substrate may vary depending on the particular substrate and on other factors such as whether the substrate is primed, oriented during manufacture (unoriented or oriented axially or biaxially) or otherwise modified. Briefly, a sample was exposed to a 6500 Joule/second xenon burner filter through borosilicate inner and outer filters at 0.35W/m2 in a Water Cooled Xenon Arc Model 65XWWR Weathering Chamber, available from Atlas Electric Devices Co. (Chicago, Ill.) for repetitive cycles of 102 minutes at about 63° C. followed by 18 minutes with a water spray. To provide a ceramer coating passing this test for a particular substrate, the ceramer coating must be capable of withstanding at least 1000 hours of exposure under these conditions with no significant yellowing, whitening, or other discoloration. The test method assesses the adhesion of coating films to substrates by applying and removing pressure-sensitive adhesive tape over cuts made in a film of the coating composition. A crosshatch pattern with 3 cuts in each direction was made in the coating on the substrate. Then a pressure-sensitive adhesive tape was applied over the crosshatch and removed. Adhesion was evaluated by comparing descriptions and illustrations. The cutting tool was a sharp razor blade, scalpel, knife or other cutting device which had a cutting edge in good condition. A cutting guide was used to ensure straight cuts. The tape was 1 inch (25 mm) wide semi transparent pressure-sensitive adhesive tape with an adhesion strength of 36 plus or minus 2.5 oz/in. (40 plus or minus 2.8 g/mm) when tested in accordance with ASTM Test Method B 1000 incorporated by reference herein in its entirety. This test measures the Taber abrasion of the ceramer composition when coated on a leather substrate and was performed according to ASTM D3884, the disclosure of which is incorporated herein by reference. This test method measures the abrasion resistance of the surface coating on leather and synthetic leathers using a rotary rubbing action under controlled pressure. The Taber abrasion machine used was Model number 5130 available from Taber Industries, Tonawanda, N.Y. The samples were cut to about 103±3 millimeters with a 7±1 millimeter hole punched in the center of the test sample. The samples were attached to the Taber disc with S-36 cardboard backer (available from Taber Industries). The testing was conducted using conditioned H-22 abrasive wheels with 1000 gram weights. A sample failed when a wear area of about 2 millimeters depth was observed. Example 5 was prepared as described in Example 1, except a silica/alumina mixture was substituted for the silica. Thus, 56.2 parts by weight of PETA were preheated to about 49° C. and then combined with 35.3 parts by weight of silica (88 parts by weight of 40% solids NALCO™ 2327, 20 nm) and 1 part by weight sodium aluminate (NaAlO2) to form a first admixture. A second admixture of 7.8 parts by weight of A-174 and 0.8 parts by weight of the compound of Formula (11) was prepared and added to the first admixture with stirring to form a third admixture. In a weighing tray, 0.15 parts by weight BHT and 0.02 parts by weight phenothiazine (both based on the 56.2 parts by weight PETA) were mixed together and then added to the third admixture to form a fourth admixture. This ceramer composition contained dimethylacrylamide (DMA) as a component of the binder precursor, but no fluoro/silane component. Specifically, 51.5 parts by weight of PETA were heated to about 49° C. 32.4 Parts by weight silica (88 parts by weight of 40% solids NALCO 2327) were added to the PETA to form a first admixture. In a separate flask, 8.1 parts by weight of 3-methacryloxypropyl-trimethoxysilane were mixed with 8.0 parts by weight DMA to form a DMA-altered second admixture. The first admixture was mixed with the DMA-altered second admixture to form a third admixture. In a weighing tray, 0. 15 parts by weight BHT and 0.02 parts by weight phenothiazine (both based on the 51.5 parts by weight PETA) were mixed together and then added to the third admixture to form a fourth admixture. Samples denoted with “*” included 4 wt-% of additive III on ceramer weight basis. Samples denoted with “*” included 6 wt-% of additive IV on a ceramer weight basis. Samples denoted with “*” included 4 wt-% of additive III of a ceramer weight basis. Samples denoted with “*” included 2 wt-% of additive II on a ceramer weight basis. Samples denoted with “*” included 8 wt-% of additive I on a ceramer weight basis. In the following Examples, coating formulations were prepared as in Example 1 using various inorganic oxides. The coating compositions were coated onto either acrylic (Cyro-FF™, available from Cyro Inc.) or polycarbonate (Cyro-ZX™, available from Cyro Inc.) substrates and cured as previously described. The cured coatings were then subjected to the Taber Abrasion Test on Plastic. As a comparative test, acrylic and polycarbonate sheets coated with a proprietary abrasion-resistant coating (Cyro-AR1 m, available from Cyro Inc.) were also tested. The inorganic oxides used and the results of the abrasion tests are shown in Tables 11 and 12. In the following Examples, coating formulations were prepared as in Example 1 using various inorganic oxides. The coating compositions were coated onto either acrylic (Cyro-ACRYLITE™, available from Cyro Inc.) or polycarbonate substrates (Cyro-CYROLON™, available from Cyro Inc.) and cured as previously described. The cured coatings were then subjected to the Warm Water Adhesion Test. The results are set out below in Tables 13 and 14. Two white full grain leathers (available from Sadesa, Buenos Aires, Argentina) designated #2040 and #2059 were spray coated with the ceramer composition of Example 1, using a commercial sprayer and holding the leather sample in a horizontal position. The coating weight was 11 grams/meters2. The samples were then oven dried for about 10 minutes at 70° C. The samples were then cured using a UV chamber with mercury vapor lamps (power setting−300 Joules/seconds/meters2) at a speed of 6 meters/minute. 1. A method of making a curable ceramer composition, comprising the step of combining a fluoro/silane component with an admixture comprising colloidal inorganic oxide and curable binder precursor, said combining step occurring in the presence of a crosslinkable silane component; wherein the fluoro/silane component comprises a hydrolyzable silane moiety and a fluorinated moiety, the crosslinkable silane component comprises a hydrolyzable silane moiety and a polymerizable moiety other than a silane moiety, and the curable binder precursor comprises a polymerizable moiety copolymerizable with the polymerizable moiety of the crosslinkable silane component; said combining step further occurring under conditions such that at least a portion of the colloidal inorganic oxide is surface treated by the fluoro/silane component. 2. The method of claim 1, wherein the admixture comprises a sol of colloidal inorganic oxides. 3. The method of claim 2, further comprising the step of stripping the composition to remove water. 4. The method of claim 3, further comprising the step of adding an organic solvent to the stripped composition to form a coatable composition containing from about 5% to about 95% solids by weight. 5. The method of claim 1, wherein the weight ratio of the crosslinkable silane to the fluoro/silane is between 4:1 and 20:1. 8. The method of claim 1, wherein the curable binder precursor comprises one or more (meth)acrylate or (meth)acrylamide monomers. 9. The method of claim 1, wherein the inorganic oxide comprises a mixture of a major amount of silica and a minor amount of at least one other inorganic oxide. 10. The method of claim 9, wherein the other inorganic oxide comprises alumina. MX2007004349A (en) * 2004-10-12 2007-06-05 3M Innovative Properties Co Protective film wear layer. American Society for Testing and Materials, Designation: D 2457-97, A Standard Test Method for Specular Gloss of Plastic Films and Solid Plastics,@ pp. 9-13 (1997). American Society for Testing and Materials, Designation: D 523-89, AStandard Test Method for Specular Gloss,@ pp. 33-37 (1989). American Society for Testing and Materials, Designation: D-1003-61, AStandard Method of Test for Haze and Luminous Transmittance of Transparent Plastics,@ pp. 569-576 (1961). American Society for Testing and Materials, Designation: D-1003-92, AStandard Test Method for Haze and Luminous Transmittance of Transparent Plastics,@ pp. 357-361 (1992). American Society for Testing and Materials, Designation: D-1003-97, AStandard Test Method for Haze and Luminous Transmittance of Transparent Plastics,@ pp. 196-201 (1998). American Society for Testing and Materials, Designation: D-1-44-94, A Standard Test Method for Resistance of Transparent Plastics to Surface Abrasion,@ pp. 219-222 (1994). American Society for Testing and Materials, Designation: D-2486-89, A Standard Test Method for Scrub Resistance of Interior Latex Flat Wall Paints,@ pp. 91-93 (1989). American Society for Testing and Materials, Designation: D-2486-96, A Standard Test Method for Scrub Resistance Wall Paints,@ pp. 92-94 (1996). American Society for Testing and Materials, Designation: D-3359-90, A Standard Test Methods for Measuring Adhesion by Tape Test,@ pp. 511-514 (1990). American Society for Testing and Materials, Designation: D-3359-93, A Standard Test Methods for Measuring Adhesion by Tape Test,@ pp. 433-438 (1994). American Society for Testing and Materials, Designation: D-3359-97, A Standard Test Methods for Measuring Adhesion by Tape Test,@ pp. 368-374 (1998). American Society for Testing and Materials, Designation: D-3884-92, A Standard Test Method for Abrasion Resistance of Textile Fabrics (Rotary Platform, Double-Head Method),@ pp. 160-164 (1992). American Society for Testing and Materials, Designation: D-4280-96, A Standard Specification for Extended Life Type, Nonplowable, Prismitic, Raised, Retroreflective Pavement Markers,@ pp. 430-436 (1996). American Society for Testing and Materials, Designation: D-968-93, AStandard Test Methods for Abrasion Resistance of Organic Coatings by Falling Abrasive,@ pp. 87-90 (1993). American Society for Testing and Materials, Designation: E-810-94, A Standard Test Method for Coefficient of Retroreflection of Retroreflective Sheeting,@ pp. 362-367 (1994). American Society for Testing and Materials, Designation: G-26-88, A Standard Practice for Operating Light Exposure Apparatus (Xenon-Arc Type) with and without Water for Exposure of Nonmetallic Materials,@ pp. 963-971 (1988). American Society for Testing and Materials, Designation: G-26-90, A Standard Practice for Operating Light-Exposure Apparatus (Xenon-Are Type) With or Without Water for Exposure of Nonmetallic Materials,@ 1069-1077 (1990). American Society for Testing and Materials, Designation: G-26-96, A Standard Practice for Operating Light-Exposure Apparatus (Xenon-Are Type) With or Without Water for Exposure of Nonmetallic Materials,@ pp. 1258-1267 (1996). American Society for Testing Materials, Designation: D 1000-93, "Standard Test Method for Pressure-Sensitive Adhesive-Coated Tapes Used for Electrical and Electronic Applications," pp.320-337 (1999). American Society for Testing Materials, Designation: D 1044-90, "Standard Test Method for Resistance of Transparent Plastics to Surface Abrasion," pp. 378-381 (1991). American Society for Testing Materials, Designation: D 3359-95a, "Standard Test Methods for Measuring Adhesion by Tape Test," pp.355-361 (1997). Floch et al., AA Scratch-Resistant Single-Layer Anti-reflective Coating by a Low Temperature Sol-Gel Route,@SPIE, vol. 1758, Sol-Gel Optics II, pp. 135-149 (1992). Iler, A, The Chemistry of Silica,@ John Wiley & Sons, New York, title page, copyright page, table of contents (1979). Lewis, et al., A Ultraviolet-Curable, Abrasion-Resistant and Weatherable Coatings with Improved Adhesion@,J. of Appl. Polymer Science, 42:1551-1556 (1991). Pleuddeman, A Silane Coupling Agents,@ New York, title page, table of contents, pp. 20-23 and 96-99 (1982). Schmidt, A Chemistry of Material Preparation By The Sol-Gel Process@,J. Non-Cryst. Solids, 100:51-64 (1988). Zisman, W. A., A Contact Angle, Wettability and Adhesion,@ Advances in Chemistry, series 43, American Chemical Society, Washington, D.C. (1964).